Too bad all the info out there on the 4 (or was it up to 5) other CR on the Southern Secondary (part 1-...) topics out there are gone! Looking forward to seeing all the "regulars" find this again! Should we leave this topic under New Jersey Railfan or somehow have a seperate forum created??? I have not seen or heard any traind this week but the rails are bright and shiny! I wish I archived the former CR on the SS forums. It is ashame to lose them. I guess this is the spot to continue on. I have not seen the train this week either. I know that propane tank cars are still sitting at the Toms River Columbia Propane plant on the TRIT. I am also looking forward to hearing from the rest of the gang. So any new news/rumors about these possible unit sand trains running down the Southern??????? When did Clayton stop using the section of track that they own?? I remember Mountain Biking through Lebanon State Forest around 1988/89 and seeing Hooper Cars in CR black parked along the tracks near Woodmansie. Actually the cars were parked on what was the main track heading south, a siding was used to bring the trains into the Clayton facility. Just past this point, the main track dissapeared under earth where the truck entrance to the plant is. Further south in what was then and still is now OOS territory near the former Chatsworth station, there were the "remains" of freight cars (wheels, plates etc). The entire OOS segment of this line has a very macabre feel to it, complete with some of the abandoned factories of the pine barrens, Steven King would love it. As of today, Friday March 12th, the "shoving platform" is still in Lakehurst on the Toms River Industrial Track. Rails show a least a couple days of rust. I've got to get some pictures of this thing and post them. Essentially what it is, is its a full length flat car with railings all around the sides. It is used in transfer moves in place of a caboose. One crew member usually is on it during moves. It offers no protection from the elements. I've only seen it used on Gillespie Branch moves (to Sayreville's Co-Steel), which isn't a long run, but the Southern Secondary run is a haul. Does a crew member stay on the platform during that whole route? As a side note, doesn't really have to do with the Southern Sec, but the other day, I guess it was maybe Monday or Tuesday afternoon, I don't remember which, there was a train coming out of "Cutters" on the Coast Line (First time I ever saw a train on that branch). Cutters is between Woodbridge and Perth Amboy, just past the top of the hill where the refineries are and the one that htey are taking down the tanks. Anyway, this train was like 4 cars long, with one engine adn a caboose on the rear. It was a CR painted engine and a CR painted caboose - looked like a little toy train from a trainset!!! That transfer platform passed my train on the Coast Line about 2 weeks ago I guess it was, heading down to the Southern - I don't know if its the same one or if was switched out or used since then, but that was the first time I saw it. I believe Cutters is served by the Metuchen and Linden Yards, not Browns. All the moves out of those yards have two locomotives and a caboose, usually, or one locomotive on each end. Thanks Mike for the picture--Strange looking device--Bring back the cabooses!!!! Not sure if Cutters is seved by Metuchen or Linden, its probably serviced by Linden. Also, Most trains out of Metuchen do have a locomotive on each end. 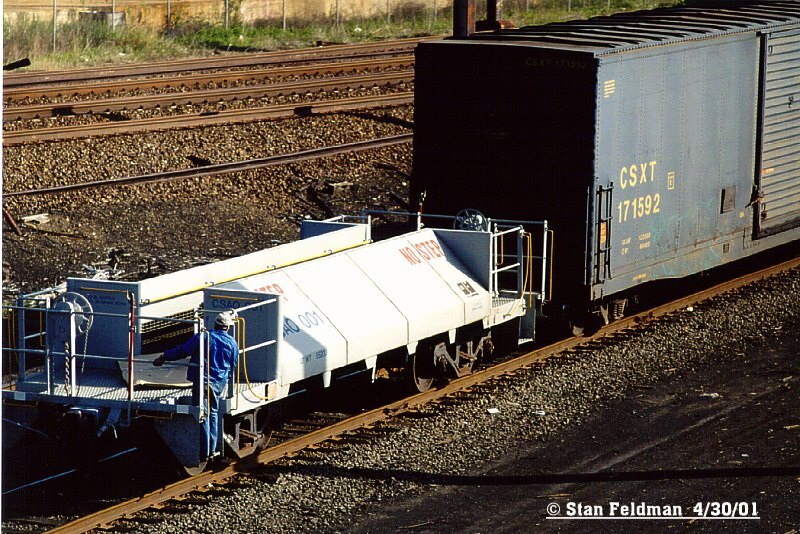 I remember a few years ago under conrail, first off, it seemed like there was a lot more frieght, and also cabooses were a lot more prominent. There are i think a few now, but back then, it seems as if every train had one. And there is also at least one train that runs one locomotive, no caboose, that would be ME-34. Also, about 6 months ago, I saw a train out of Metuchen with a shoveing platform, AND a dark future CSX locomotive. Then later that day I also saw an NS thorughbread (spelling?) locomotive, with the horsehead, with a train! Odd day to say the least! The transfer platform that we have up here in Browns doesn't look quite like that. Ours doesn't have that narrow aisle, but rather just railings surrounding a flat car (picture a gondola car with the sides removed and railings put up in place of them). The railings are kind of like the ones that are used at Great Adventure (or any amusement park) to create lines for the rides. The car up here is painted yellow and gray. Have the repainted units ventured out onto the NEC yet? All the local freights I've seen in New Brunswick have still been Conrail GP38s. Glad to see that the forum is back up. :D Haven't been out to Lakehurst recently, as I'd love to get some photos of the SA31 on the Toms River Industrial Track. Last winter, it was a night move for the SA35. I would like to see some blue engines at Browns Yard, though. Just a little variety aside from CSX 2740 & 4415. Even having the 4441 back (Dark blue paint) or the 4431 (Conrail blue) would be nice. Just my two cents worth.